Eggs are nutritious little marvels! They are one of the cheapest, most completely nutritious foods we have in the kitchen. An they are so versatile, ready to make a meal in a minute. Check out some of the basics of egg cooking with Ann – separating the yolks from the whites, boiling, poaching, and scrambling to one of those easy, delicious baked omelets, frittatas. Look and Learn! 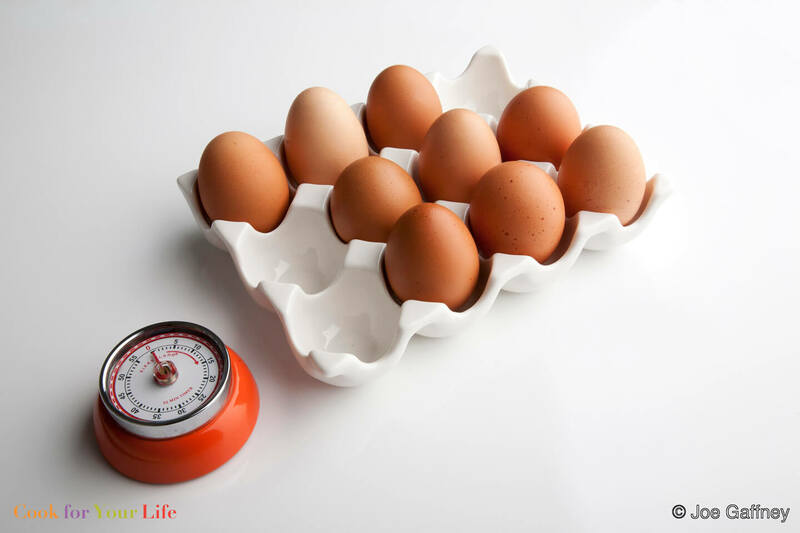 Hardboiled eggs are a protein packed snack to keep in the fridge. They are super easy to make, and here’s the best way to do it. If you cook them exactly this way, they won’t crack, nor will they get a gray-green ring around the yolk. Ann will also tell you how to soft boil using the same method too. Easy peasy! Look and Learn! Many recipes call for the eggs to be separated. There are many gadgets for this easy kitchen job on late night TV ads, but the easiest way, and cheapest, is to use their own shells. Watch this quick video and see Ann show you just how easy it is to do! Look and learn! Poached eggs are a favorite breakfast preparation that happens to make an egg that’s delicious on top of salads or bowls of grains and greens. Because poached eggs are cooked without any fat, they are really easy to digest, a good thing for those on a bland diet or in cancer treatment. There’s one caveat: if you are in chemo, especially if you are on an anti-microbial diet, make sure to poach the eggs until the yolks are hard. Look and learn! Eggs are a wonderful food, and when well cooked as in a frittata, they can be a fast, easy option when fatigue from cancer treatment strikes. This classic Potato Tomato Frittata is a meal all by itself that’s quick and easy to make, good for you and completely delish. Aside from the fact that they taste really good, cooked tomatoes are bursting with antioxidant lycopene, the sautéed garlic brings allicin, and the spuds add some carbs for quick energy, as well as a dose of vitamin C. So easy! Scrambled eggs are a favorite of mine. They are soft, delicious, and a great way to eat eggs during cancer treatment. These eggs use whole milk and butter so three eggs are plenty for two people. For those who need to add calories to their diet, instead of milk you can use light cream as the French do, or make them with delicious plain Greek yogurt. Look and learn!